Growing down in the grykes where it is sheltered from any winds. A fully native garden plant which carpets areas growing to 25cm high. (Bluebells in top left corner). 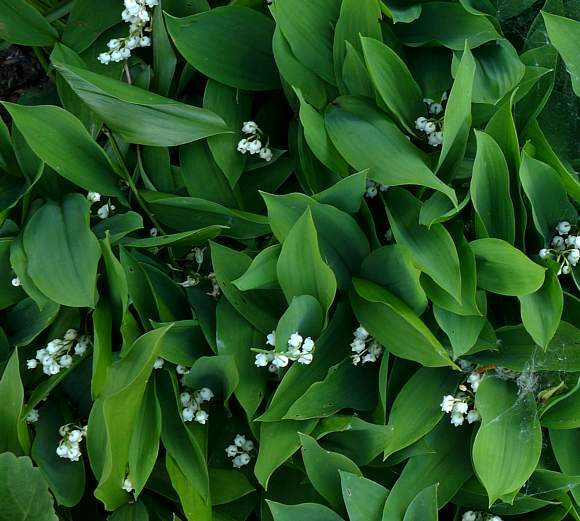 The leaves of Lily-of-the-Valley are said to resemble those of Ramsons, but un-like those, are exceedingly poisonous and do not smell of garlic. They stick up in pairs, curving-outwards in a V-shape, just two from each plant. The leaves, all basal, are like dagger blades, but floppy harmless ones. Bird's-eye view. Leaves broadest somewhere near the middle tapering to a 60° pointed at the end. 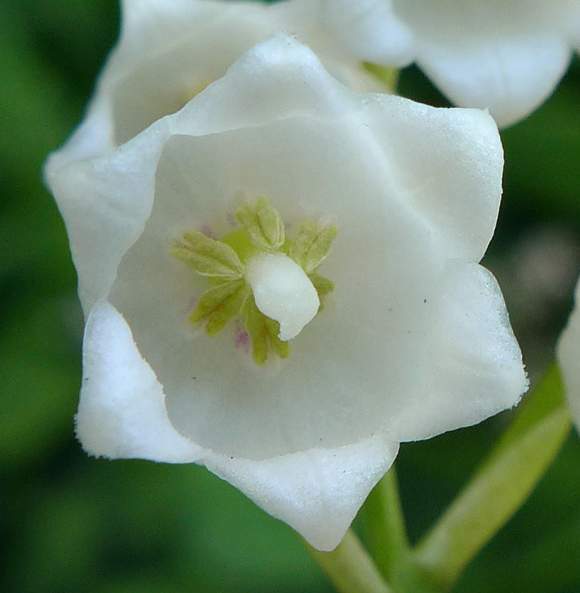 A single round narrow one-sided flowering stem (raceme) emerges from the centre with several white bell-shaped flowers hanging off near the top. 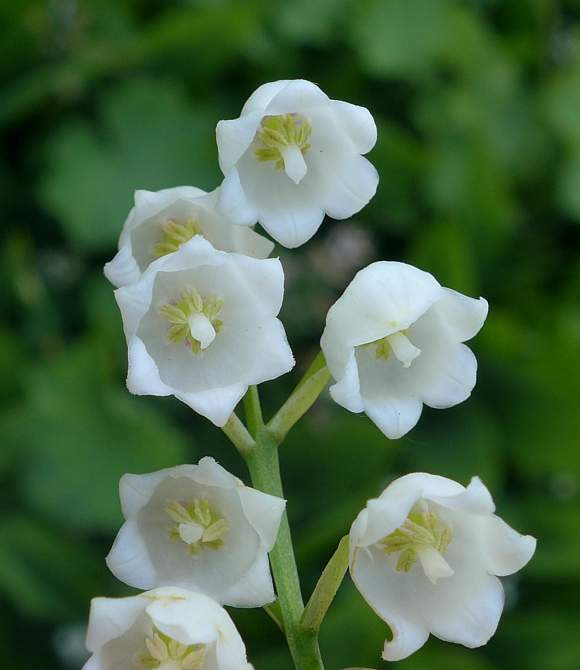 Broadly spherical with six short curled-up pointed 'petals' the flowers hang off one side of the flowering stem. 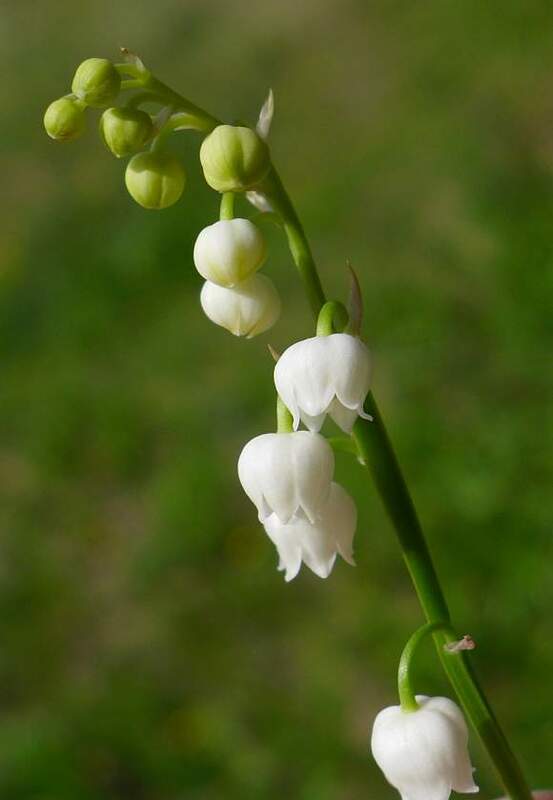 Each flower on a short drooping stalk with a flap where the stalk peels away from the stem. This flap later turns paperish and brown. An insect has nibbled away at the bell allowing a peek at the insides. Drooping downwards near ground-level the insides of flowers are never normally visible by humans, unless you hold the flower upside down. 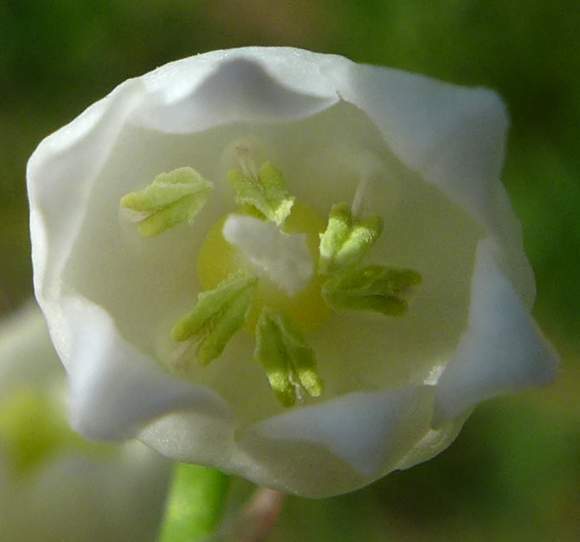 A sneak pre-view of the innards, which has 6 pale-green anthers on what must be very short stamens plus a longer but stubby central white style to which the anthers are all inwardly directed. 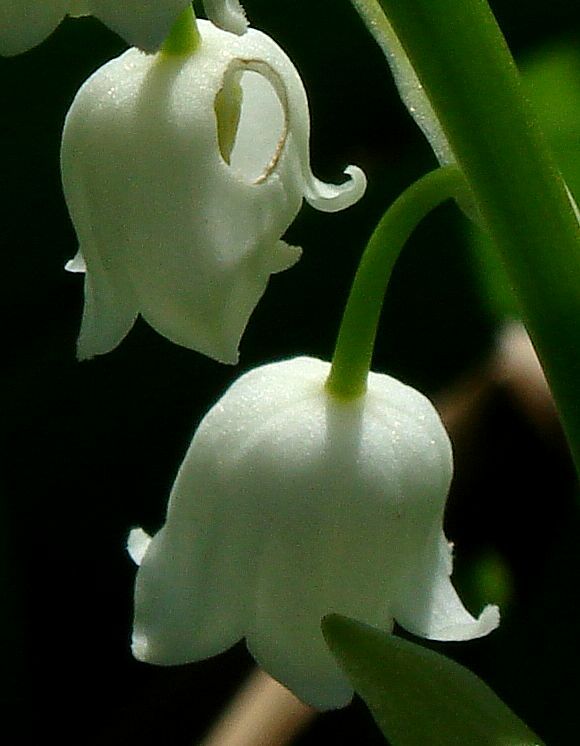 The anthers are arrow-shaped and split into 'two' roughly parallel to each other. 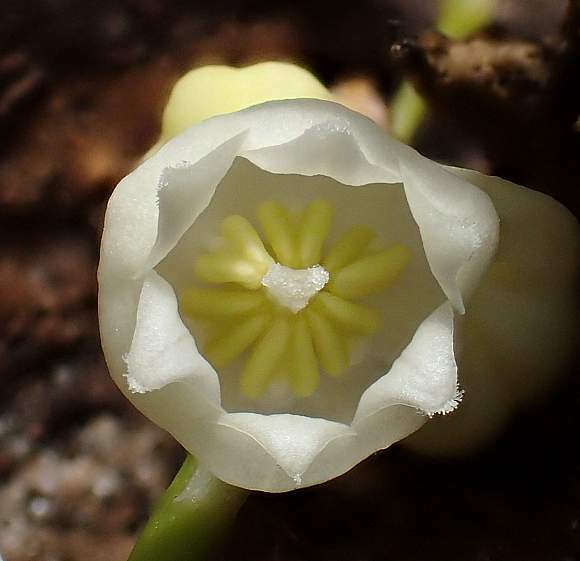 The six V-shaped anthers are on short white filaments. The irregularly shaped style is here triangular shaped, white and near the centre. 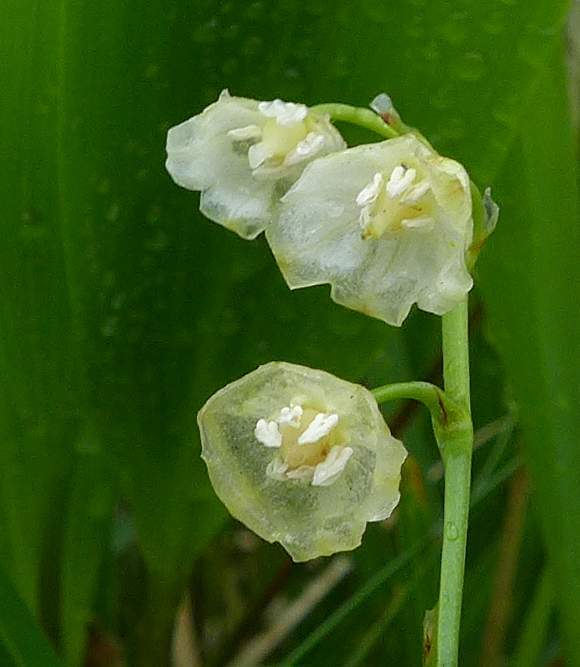 The opaque white petals become thin and translucent as the flower goes to fruit. The flowers going to fruit. The berries are also poisonous, turning red from un-ripe green. Some similarities to : Solomon's Seal. The leaves, flowers and berries of this plant are very poisonous. 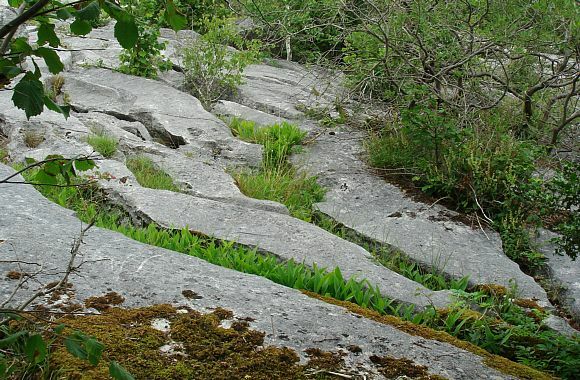 It prefers to grow on limestone, or on sand. 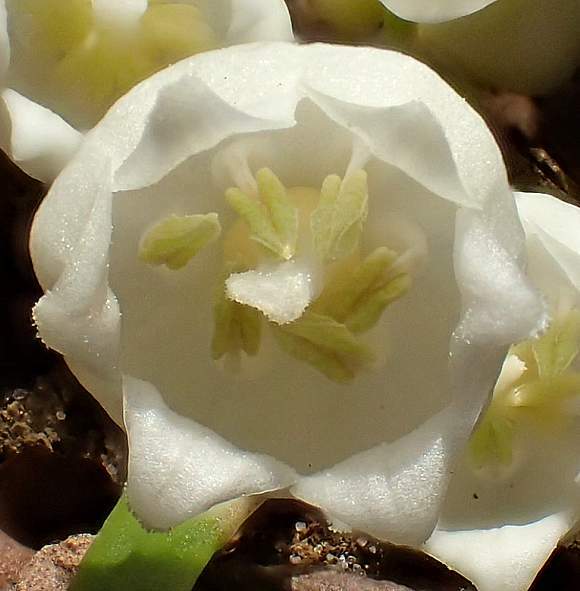 It is sold as a garden flower, from where it may escape into the wild. The flowers have a sweet fragrance. 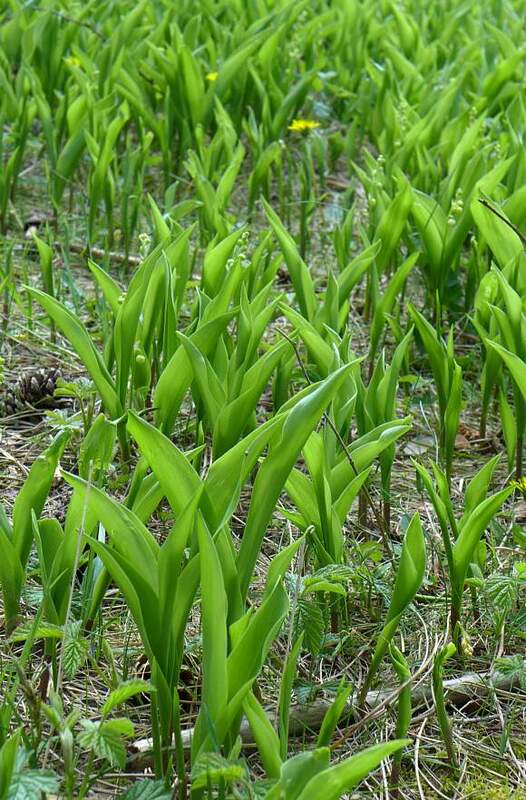 Despite it not smelling of garlic, the leaves of this plant, which come before the flowers, have been mistaken for those of Ramsons and eaten, often with fatal consequences. Now said to belong, not to the Lily Family, but to the Ruscaceae family, which has itself now been moved into the Asparagus Family. A green dye can be extracted from the leaves of this plant. The odorous compounds isolated from around the headspace of the flowers include Benzyl Alcohol (35 %), (Z)- 3-hexen-1-ol (11 %), Citronellol (9.6 %), Geraniol (8.4%), (Z)- 3-Hexenyl Acetate (7.8 %),Geranyl Acetate (3.3 %), Phenylacetonitrile (3.0 %), Farnesol (1.9 %), Citronellyl Acetate (1.1 %), Nerol (1.3 %), Geranial plus Benzyl Acetate (0.96 %), 2,3-DiDydroFarnesol (0.88 %), Phenylethyl Alcohol (0.78 %), Octanal (0.15 %), Nonanal (0.1 %), Decanal (0.07 %), Neral (0.02 %) and traces of several other compounds. The green-grassy notes are provided by (Z)-3- hexenal (trace) and (E)-2-hexenal (0.18 %); the green-pea and galbanum-like notes by 2-isopropyl-3-methoxypyrazine (trace) and 2-isobutyl-3-methoxypyrazine (trace) and the fruity raspberry notes by β-Ionone (trace). 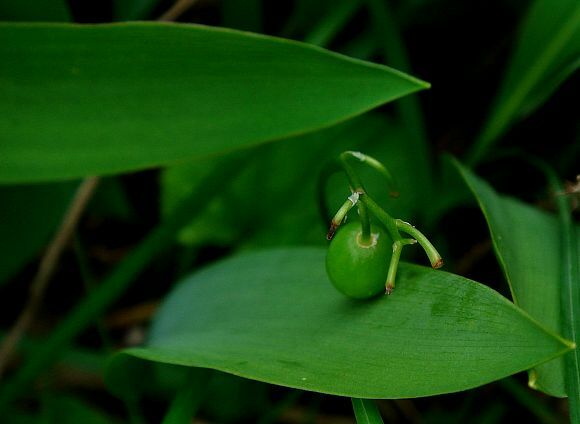 The naturally occurring alkaloid (found in Cinchona species, such as the Quinine Tree ) quinidine is used medicinally to counteract the irregular heartbeat caused by ingestion of parts of Lily-of-the-Valley plant. Quinidine is a cardiac depressant, and acts by controlling the cardiac rhythm. Sparteine, another naturally occurring alkaloid found Broom and in some other members of the Pera Family, acts similarly and is also used medicinally to treat heart arrhythmias and poisonings by cyanogenic glycosides. It acts by blocking the Na+ channel. The plant also produces a valuable pharmaceutical drug, convallotoxin, a cardiotonic drug, a digitalin-like substance. Of all the naturally occurring cardiac glycosides, convallotoxin is the most potent. 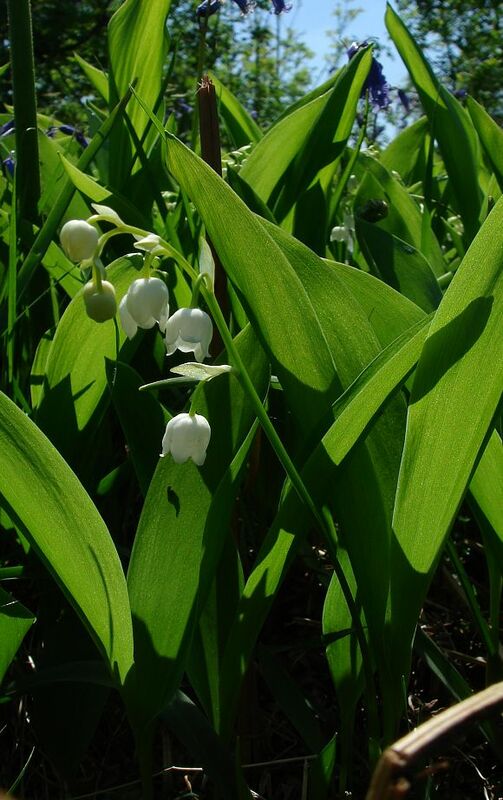 Because of this Lily-of-the-Valley is very poisonous, ingestion of parts of the plant will typically produce burning of the mouth and throat, nausea, vomiting, abdominal pain, headache, dilated pupils, slow and arrhythmic heartbeat, sometimes resulting in coma and death. 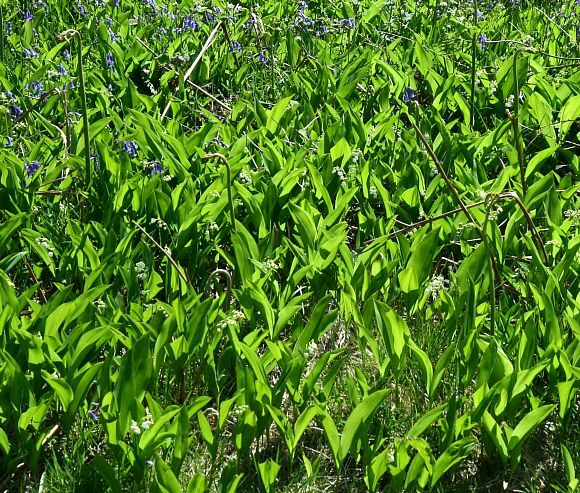 The same toxins are present in other members of the Lily family, for instance Star-of-Bethlehem. 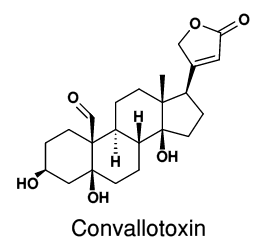 Convallotoxin resembles Digoxigenin which is found in Foxglove. 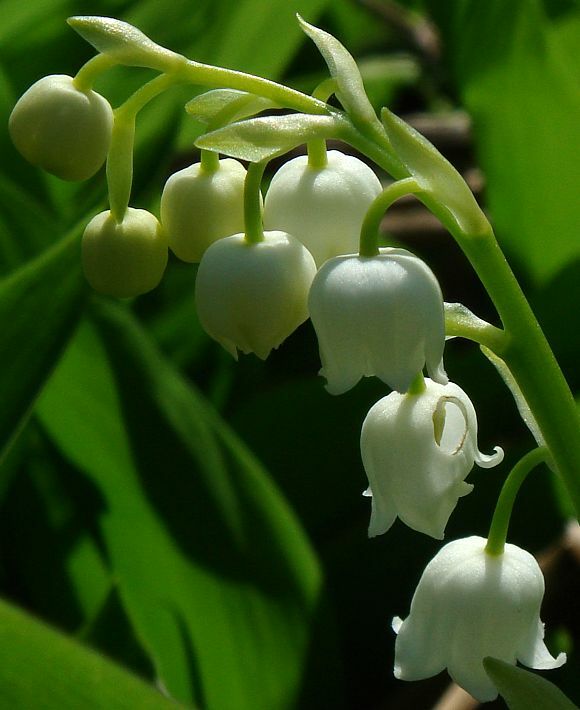 Besides Convallotoxin, which is the main toxin representing 40% of the total cardiac glycosides in Lily-of-the-Valley, 37 other cardenolides (cardiac glycosides) have been isolated from Lily-of-the-Valley, amongst them Convallarin , Convallamarin and Convallamaronin , and which are used medicinally. Azetidine-2-carboxylic Acid is a non-proteinogenic amino acid (NPAA) meaning that it does not occur in natural proteins. It is the homologue of Proline, which is a natural amino acid found in proteins. 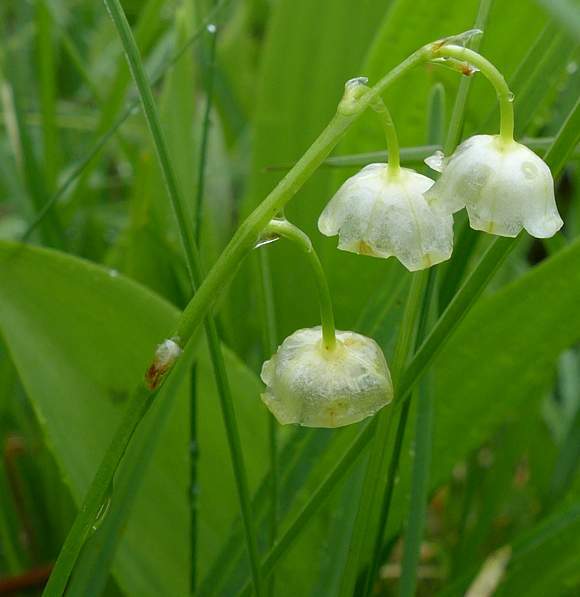 Azetidine-2-carboxylic Acid occurs in Lily-of-the-Valley as a poison which seems to be devised to act as an analogue to Proline, and because of this can accidentally be incorporated into proteins in place of Proline, where it may disrupt the normal function of the protein. Azetidine-2-carboxylic Acid is therefore toxic. 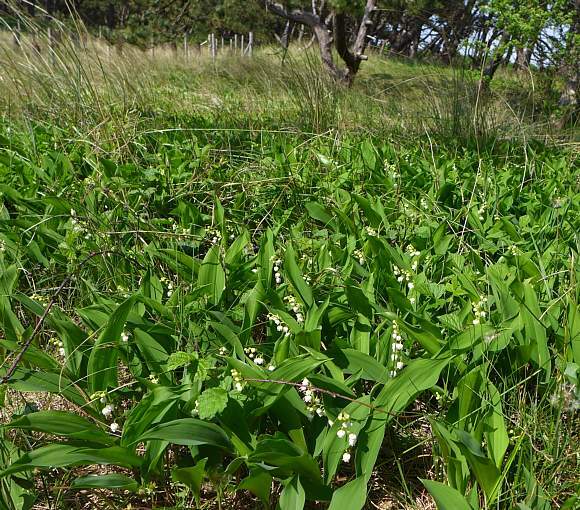 It occurs in the rhizomes and leaves of Lily-of-the-Valley, and also in some species of Solomon's Seal. To a much lesser extent in Sugar Beet. Proline, one of the natural 21 or 22 amino acids, is a non-essential amino acid, meaning that although we cannot live without it, humans do not need to consume food containing Proline since humans are able to synthesize it within their bodies. [Proline is only shown for comparison with Azetidine-2-carboxylic Acid and does not occur in Lily-of-the-Valley].